I love you to the moon and back, to infinity and beyond, more than words can ever express… but we have to talk. We need to talk about pants. Yes, pants. And, more specifically, I’d like to talk about your pants. Do you see these things right here? 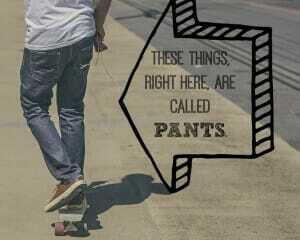 Those things are called pants. And the thing about pants is that everyone wears them. You have an entire drawer filled with options with which to cover your biscuits. You can wear long pants or short pants, jeans or sweats, fitted waist or elasticized. I honestly don’t care what you’re wearing on your bottom half as long as it is something. I don’t care what your outfit looks like. I don’t care if your clothes match. I don’t care if you wear socks. All of these things are negotiable and, during my seven-plus years of this motherhood gig, I’ve learned to choose my battles wisely. 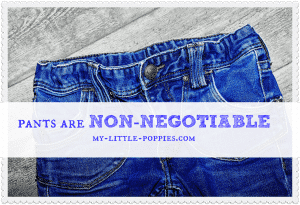 But the thing is: pants are non-negotiable. I’ve let you walk around Target dressed as Batman. We’ve gone shopping while you were dressed like a princess. You’ve worn two different shoes to the playground. You’re the third 3-year-old that I’ve parented and I know you are trying to find ways to express your uniqueness and exert control. I get it, I truly do. But you’re going to need to find a way to do those things while wearing pants. If I roamed around in public sans-pants, I would get myself arrested in short time. You have to wear pants in Target, at the library, and in Market Basket, and you’d definitely want to be wearing pants at the playground (two words: wood chips!). In the past, I’ve joked and referred to you as the New England Nudist, but it’s just not funny anymore. 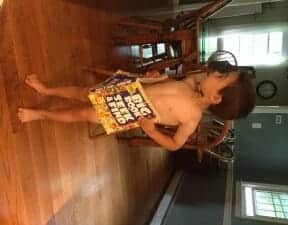 For close to a year now, when I ask you to put on pants, you throw an epic tantrum. It’s like clockwork: you wake up at 6:30 am and roam around naked for over an hour, ignoring my get-dressed pleas, even when I tell you that we have to be somewhere. Finally, miraculously, I get you upstairs to your room -in closer proximity to pants- where you proceed to pitch a fit. You scream and cry and carry on as if your pants, which of course you aren’t wearing, were on fire. This fit can last anywhere from thirty minutes to three hours. All too often, I need to essentially sit on you in order to wrestle pants onto your flailing, angry little body. This pants war is exhausting. I would wave a white flag, except I cannot. Why? 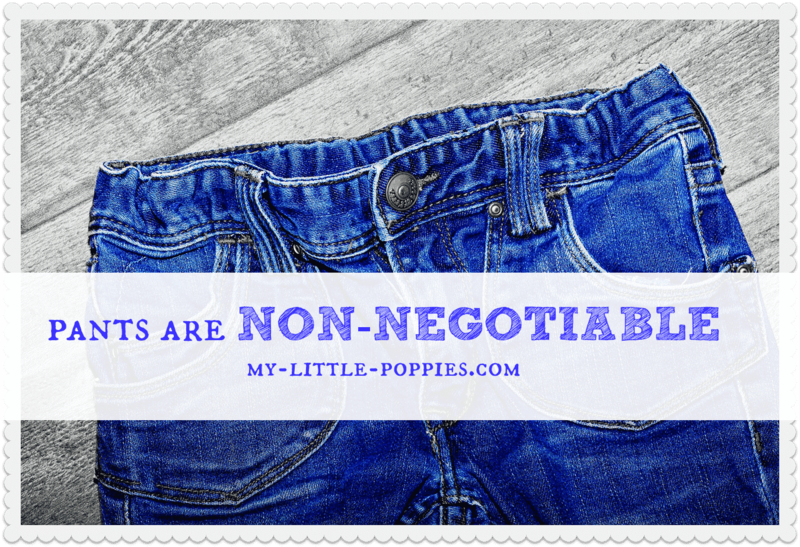 Because, as stated, pants are non-negotiable. Can we please war about something else? Your shirt? Your shoes? Anything other than your pants? But, I love you more when you wear pants. Couldn’t you try dresses instead of jeans/trousers? I LOVE it!!! As a gramma with two grown children and 4 g babies (the twins will be 4 next month and the baby will be 3 in September), the struggle is real!!!!! Lol. I’m sharing this so everyone can enjoy it! That would exhaust me, too. It’s strange what kids get hooked on sometimes, isn’t it? The struggle is real. 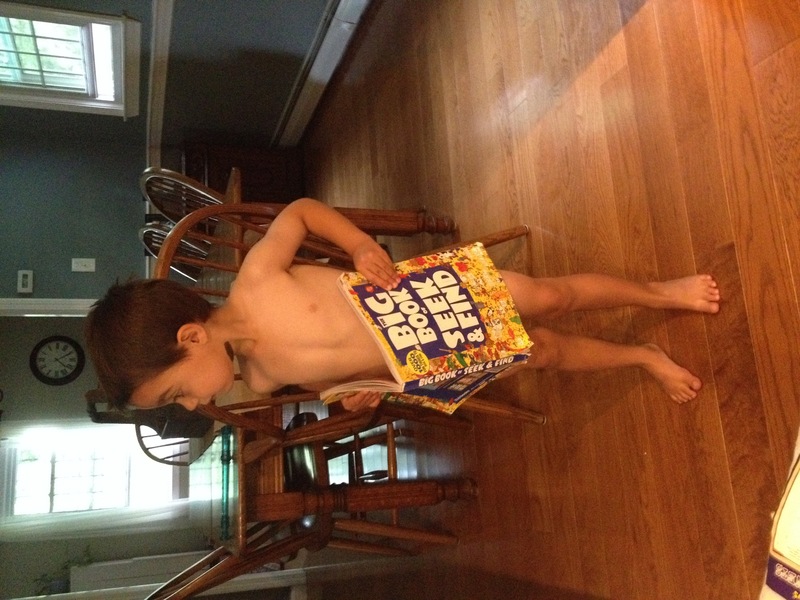 Poor kid, being made to conform to a pants-lovin’ society when all the kid wants to do is rock that diaper. Loved your post. Brings back a lot of memories.